Welcome to our favorite issue of WDW Magazine each year. That’s right, it’s the Christmas Issue! Yipee! No music was playing not even a band. By an army of elves, Deck the Halls they sung. OK, Clement Clarke Moore I’m not, but I do want to invite you to check out our Christmas at WDW issue. 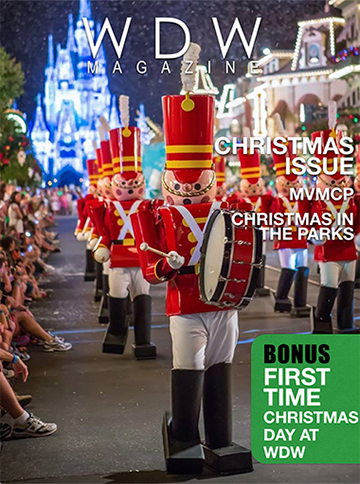 It’s packed full of Christmas spirit, cheer and holiday WDW fun. We start out talking about Christmas all around WDW—in the parks, in the hotels, and all around the world. We take a special look at Mickey’s Very Merry Christmas Party, the Osborne Family Spectacle of Lights, and Holidays Around the World. The Christmas theme continues in our Helping Hands section where we look at the top 10 things first time visitors need to know about Christmas at WDW. We also take a look at dealing with Christmas Week crowds and the 5 “must haves” for a Christmastime trip to WDW. The fun continues with Bring the Magic Home where we see how to make that great gingerbread from the Grand Floridian. We also learn how to make sweet potato pancakes from the Wave in the Grand Floridian. Boy, there is a lot more, but I’m going to stop talking and let you enjoy. Christmas at WDW. What could be better?